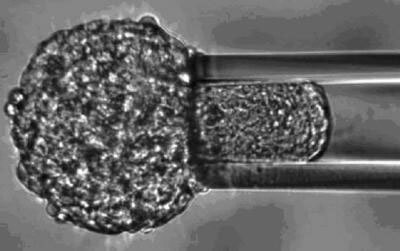 (Nanowerk News) A collaboration of French and Canadian researchers have found that sucking a portion of a spherical globule of cells into a tiny pipette provides information about the adhesion between cells and the elastic properties of the tissue. The method is a novel approach for the study of the structural properties of tissues, and should offer insights into processes such as embryonic development, tissue growth and cancer. A paper describing the research appears online in Physical Review Letters on May 24. Sucking a small sample into a pipette is a simple technique to discover the mechanical properties of tissue. Conventional techniques for measuring the structural properties of tissues typically involved placing a sample between a pair of plates and observing how the tissue responds to compression. The new pipette technique complements the parallel plate method, as well as allowing researchers to obtain a wider range of measurements. In addition, the pipette approach could potentially allow for measurements to be performed on living tissue in its natural environment. In a Viewpoint article in the current issue of APS Physics Gabor Forgacs and Ioan Kosztin of the University of Missouri note that interpretations of pipette-based cell measurements are somewhat unclear, in part because relatively few cells from a sample are sucked into the pipette. The technique is also limited to cells that bind together strongly. Nevertheless, pipette measurements offer a novel tool for studying cell development and diseases, as well as potentially aiding researchers involved in tissue engineering for growing artificial organs.